Do you want to engage customers in a loyalty program as quickly as possible and without efforts? There is a good decision based on the tablet, which is placed at the cash desk facing the customer. inCust program has been installed on this tablet. This program allows every customer become a member of your loyalty program; for this customer simply enters his own phone number. 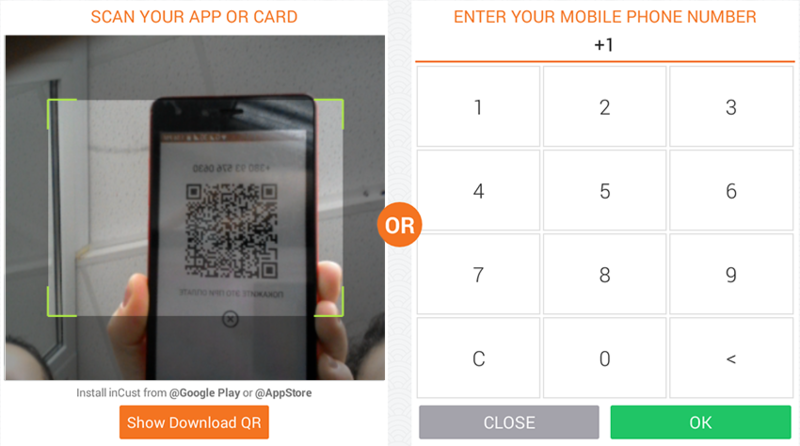 Owners of smartphones or smart watches can scan the QR code of their discount card in the inCust mobile app using the tablet camera. In fact, the Kiosk serves as a customer scanner for cash desks and interactive kiosks at the same time. The customers see their current wallet, operation details, news and promotions. Plus they evaluate the quality of service. Install on the tablet the inCust Kiosk app. Secure the tablet screen facing the customers, so they could see the application interface. While the salesperson is making a purchase order, the customer enters mobile phone number or scans a digital card in the form of the QR-code from inCust mobile app using Kiosk app on your tablet. Information is transmitted instantly over the Internet to the salesperson Register and to the purchase are applied the loyalty program rules – discounts, bonus points and special offers. The customer can take a look at news and find out the information about promotions, while he has been served. This is the information that you have posted in News and info tab in the Control panel. In the same window in the right for the customer is available up to date information on the current amount of the purchase, available bonus points and gifts. In addition, you automatically collect customer feedback on the quality of service. Download the app via the link or find it using ‘inCust Kiosk’ in the Google Play Market. After installing the application, to set it up go to Control panel. Kiosk application will be assigned immediately with the Register on which your salesperson works. Accordingly, all transaction data will be transmitted to it. Select a Register and then click Edit.. Check Kiosk Mode and select the operating mode Customer Authentication. Do you want to reward the customer for the visit? You can credit him bonus points every time the customer uses a Kiosk at the point of sale. This simple and clear for the customer, in fact it is a payment for visit. To do this select the Visit Reward , for example, 1 bonus point and the Account type, such as bonus points. Click Save and close. Kiosk has been set up. To access to it use a pair of login and password associated with the Register. Please note! 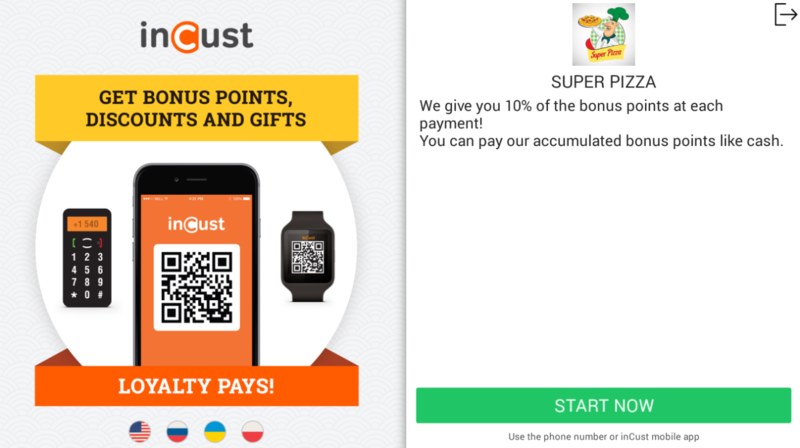 On the start page of the inCust Kiosk app there are displayed logo, public title and description of the current loyalty program. 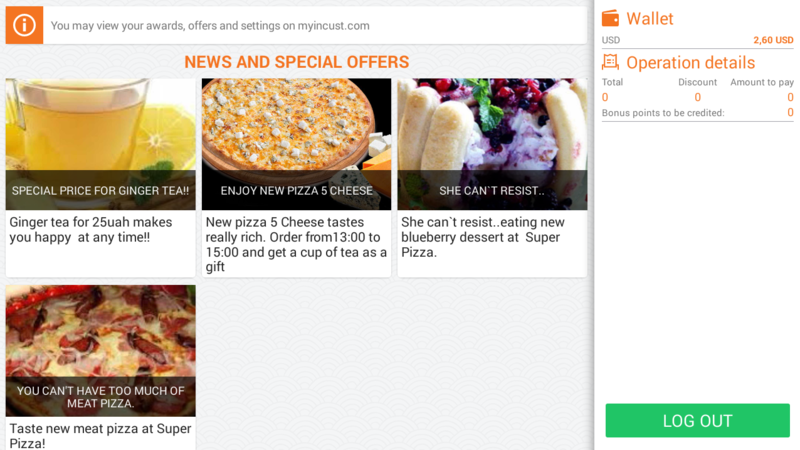 Check them out correctly in the Control panel, tab Loyalty programs. Do not forget to add the information in several major languages. Note that the customer can switch Kiosk to their language and it is important that they could see the information in their own language. Let’s check Kiosk work in the team with the Register. Go to the Register and enter the login and password. The same login and password type in the inCust Kiosk app. Install the inCust mobile app for customers on your phone. Open on the phone QR code of the card and bring it to the camera. You will enter the Kiosk. The salesperson has usually an open dialogue of choosing the customer. If customer currently has been registered in Kiosk, for the salesperson will happen the same action, as he has just entered customer phone number or scanned his card using card reader. If it is already existing customer information about him will appear in the upper right corner of the Register. For the new customer will automatically be displayed new profile on the screen. The need of displaying on the screen of the Register profile of the customer automatically or only for new customers you can specify in the settings of the loyalty program. The customer can take a look at news and find out information about promotions, while salesperson is making a transaction. Right under the Operation details the customer sees the amount of the check receipt of the current purchase and a little higher is Wallet – all available rewards. As soon as salesperson has closed a check, for the customer is automatically shown a window with a request to rate the service. Do not worry that the customer will be able to exit the application and use the tablet for their own purposes. If your tablet runs on Android versions above 5.0 the customer won’t be able to close the application by their own or log out of it. The inCust Kiosk app makes it easy to identify the customer. There is no need for salespeople to ask for a card or enter a phone number and look for a customer in the database. InCust Kiosk helps reduce the maintenance time, don’t annoy the customer with questions and as a result to earn more over the short and long period!